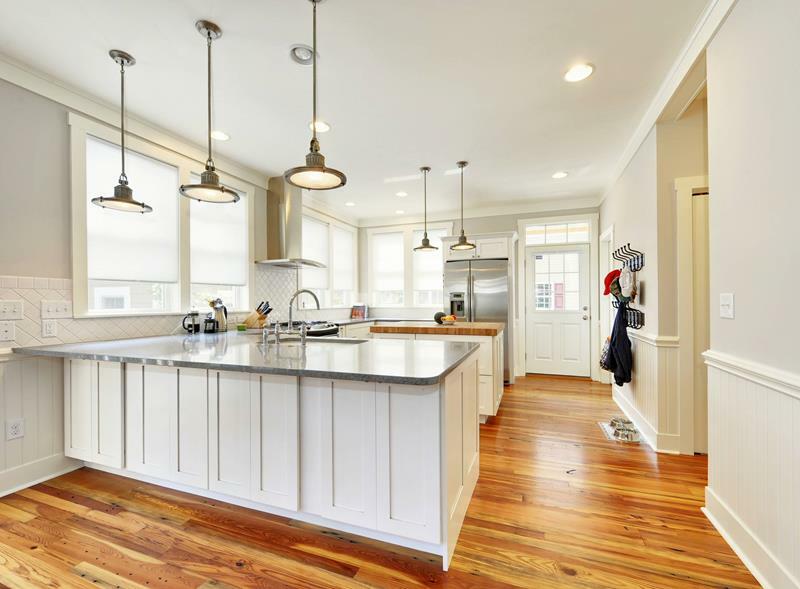 Kitchen peninsulas really don’t get enough credit because they can truly transform your whole area. While kitchen islands are great, sometimes you don’t have room for one. That’s typically where we see kitchen peninsulas come in. 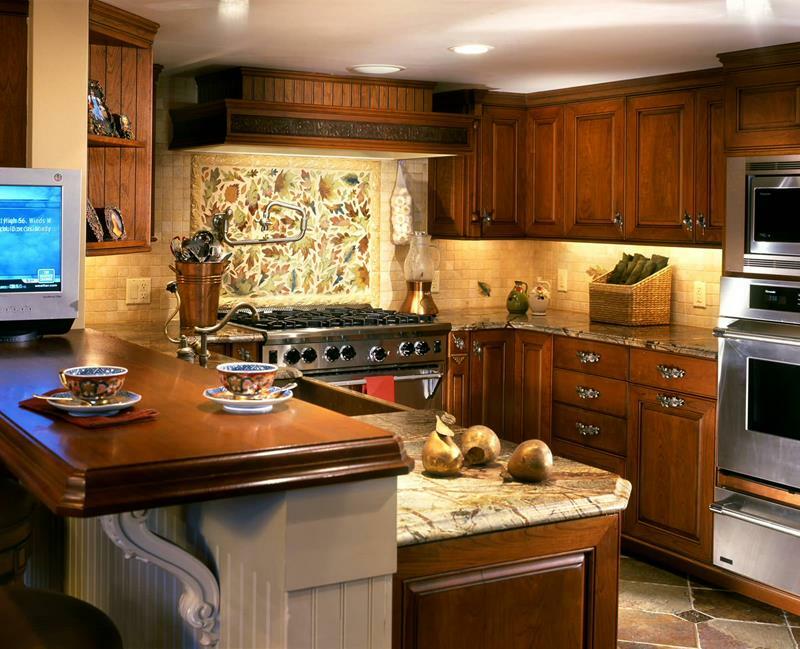 Some kitchen peninsulas are part of an L-shaped kitchen or one that wraps around three sides. Often, they separate the kitchen from the dining room area. 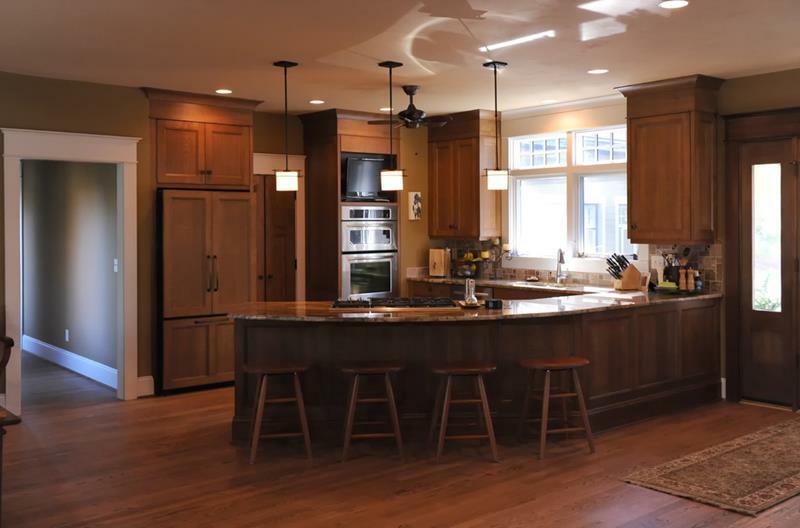 They give you the same functionality as a center island – more counter room, extra dining space, and some even feature the range. 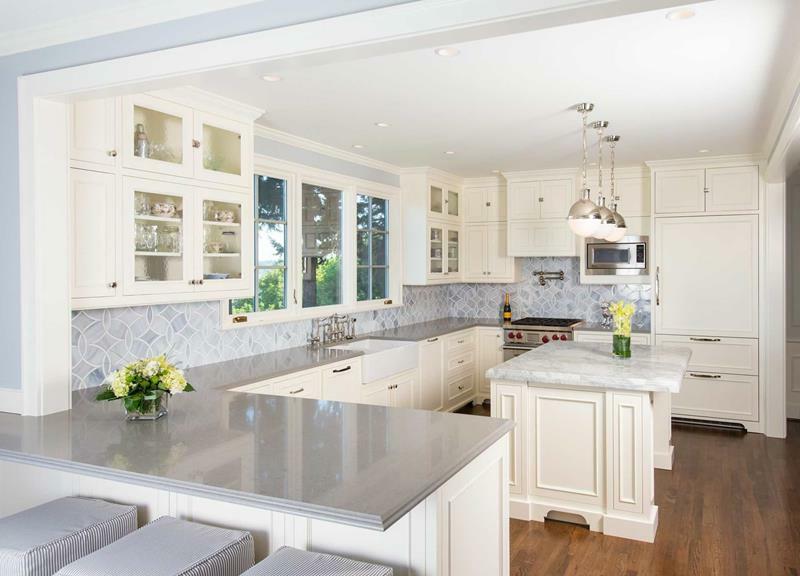 Below, we’ve gathered more than 30 kitchens with peninsulas for you to browse through. You will see that they work with kitchens of all sizes, sometimes together with center islands and sometimes not. 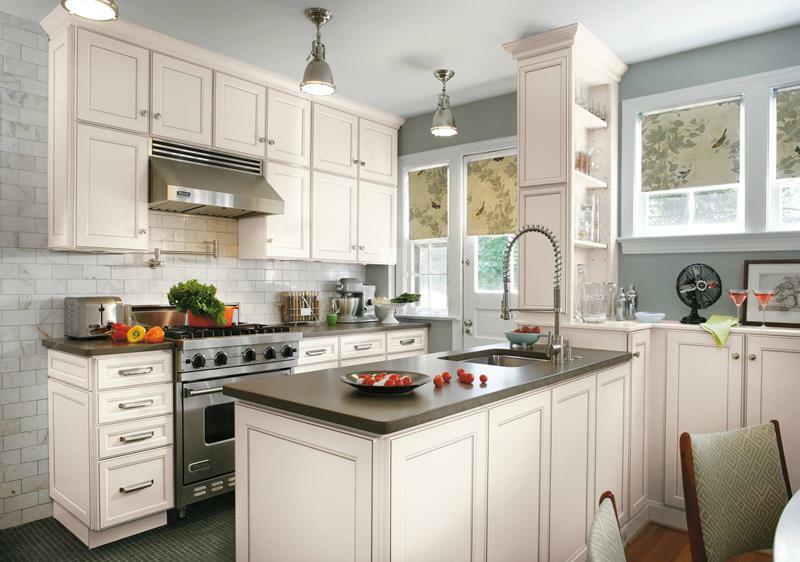 Go ahead and figure out what will work best for your kitchen space. 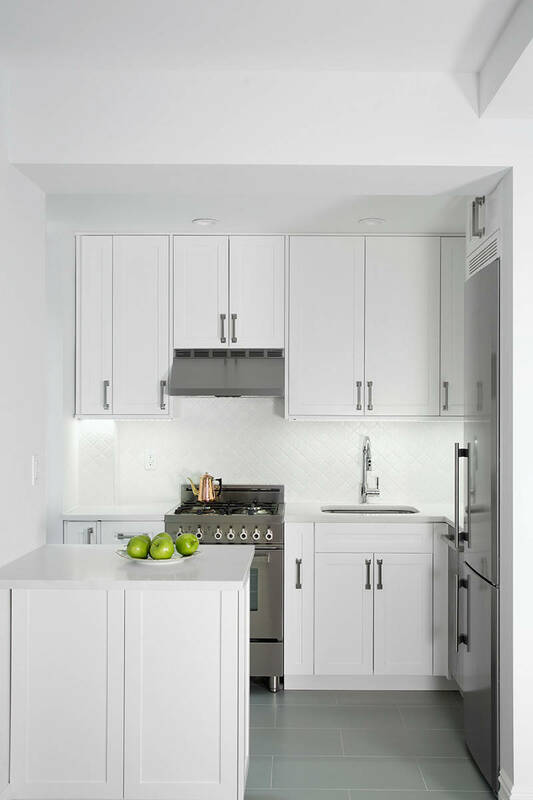 We love how this whole peninsula area seamlessly connects the kitchen to other areas of the house. It gives you plenty of function and space for dining. 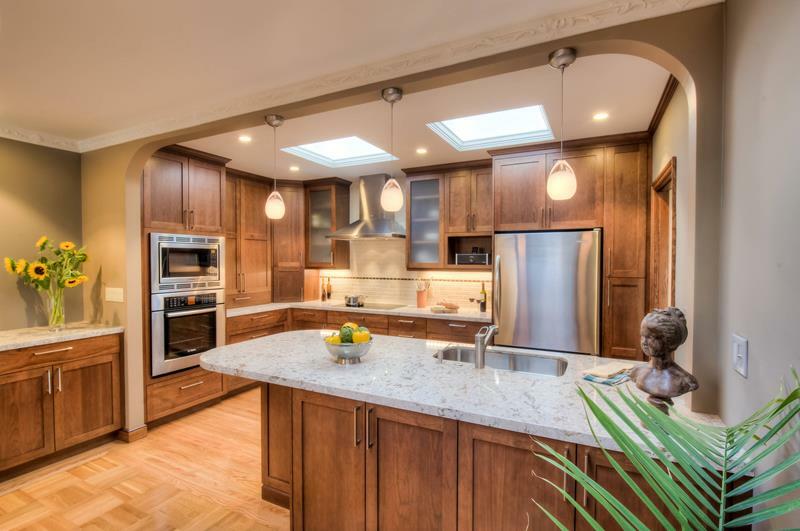 This comfortable kitchen has all the added counter space it needs thanks to this peninsula. This area is complete. Gather around and have a nice meal. 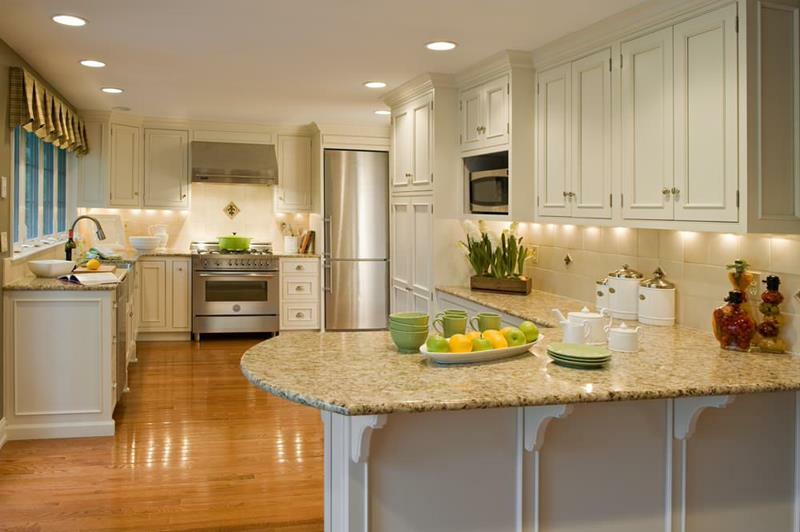 With this peninsula, you have plenty of room, and it looks great with the darker countertop. 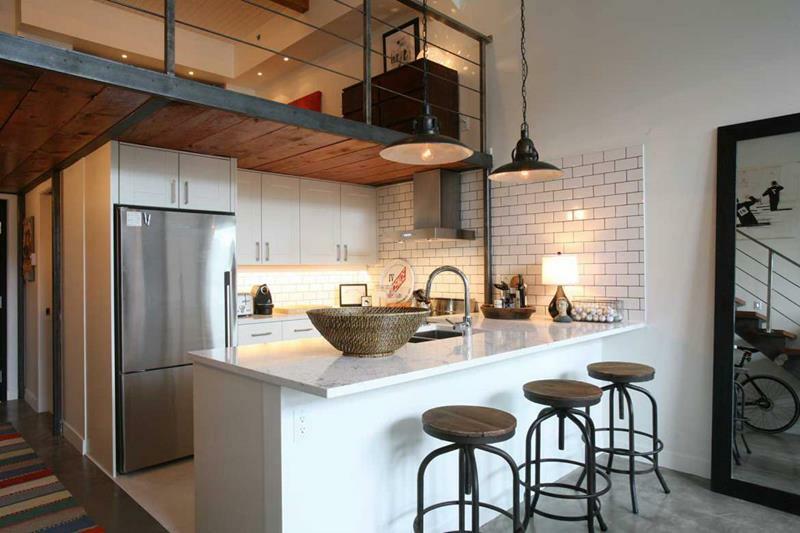 This industrial kitchen takes a rustic look, and the peninsula here lets you pull right up to have a drink or enjoy a meal. 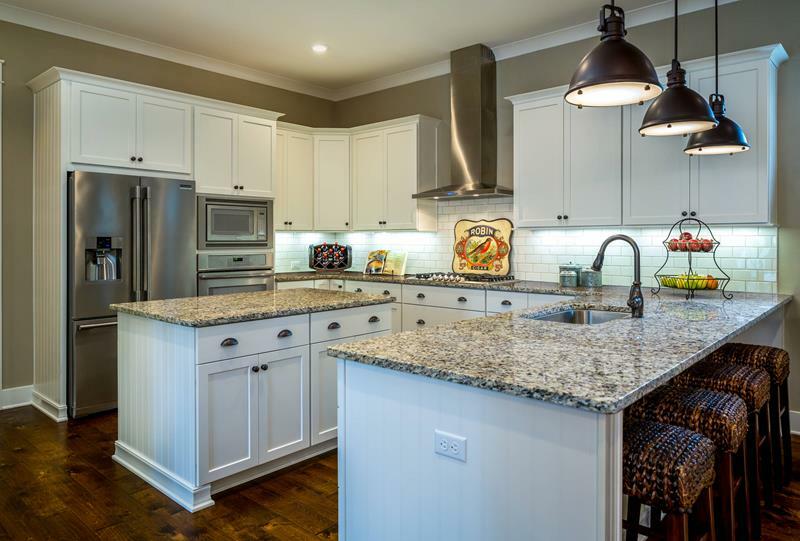 Peninsulas don’t have to be large counters that take up a ton of space. 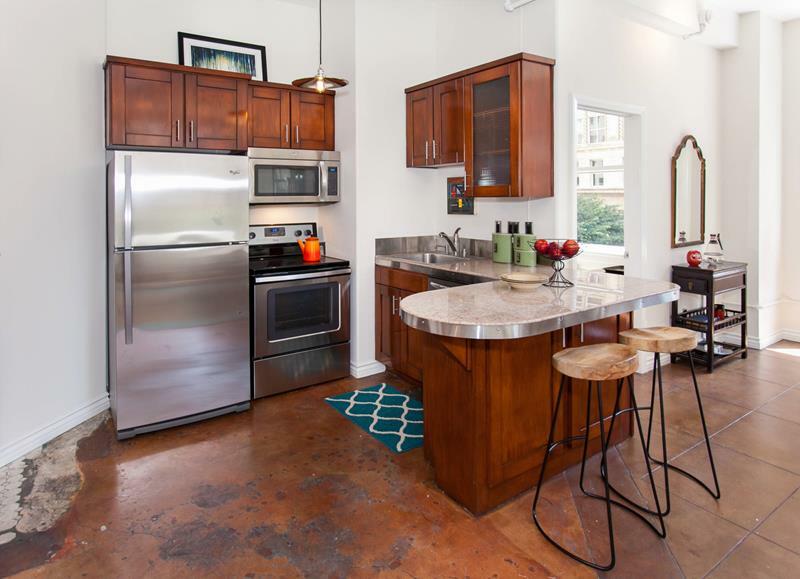 This one is small, giving you exactly the right amount of counter space. 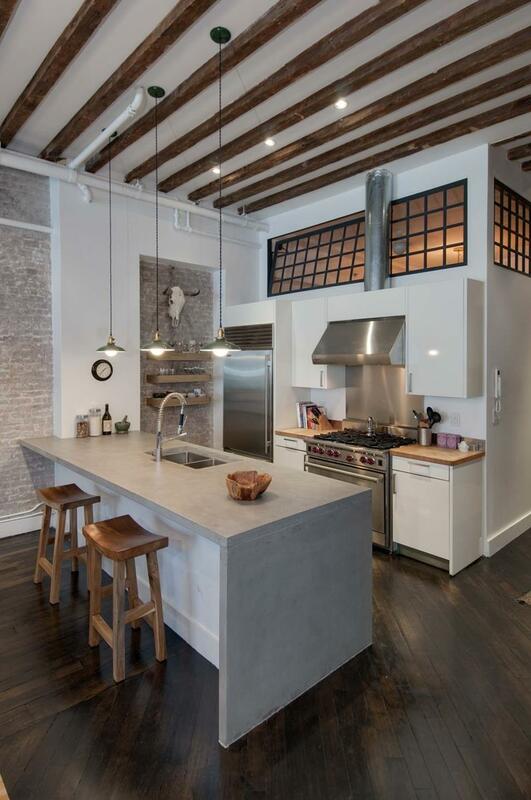 We love the overall architecture of this kitchen space. 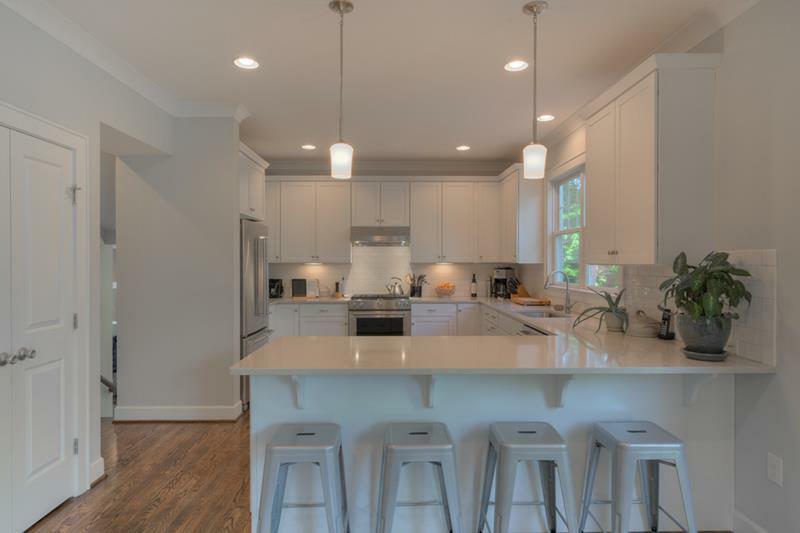 The hardwood cabinets work perfectly. The peninsula and the added counter on the wall expand the space you have to use. 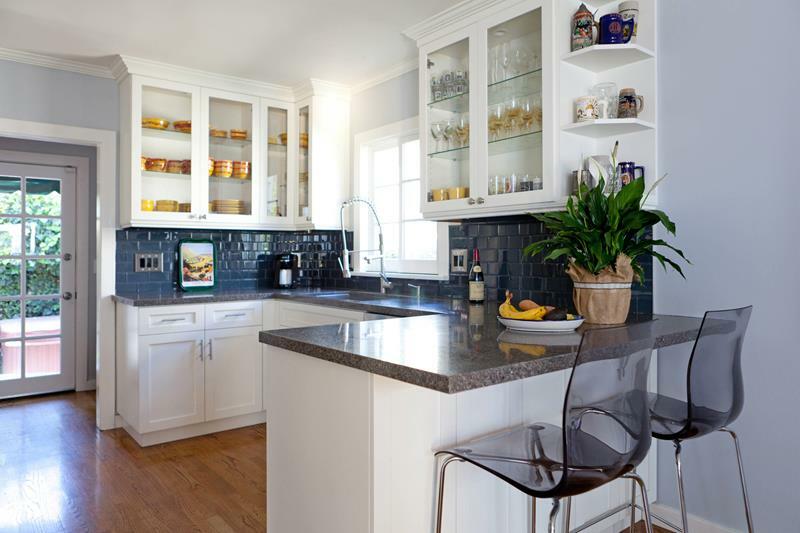 We love the welcoming tropical feeling of this kitchen, and this peninsula is the centerpiece. It gives a natural border to the space and matches the whole room wonderfully. This curved peninsula looks wonderful. With a hardwood structure, it blends well with the whole area and gives you a great place to pull up and have a meal. This small peninsula forms an L-shape from the counter attached to the wall is gives just the right amount of added functionality. We love when kitchens don’t become complicated. This peninsula gives you added function and somewhere to enjoy a meal. 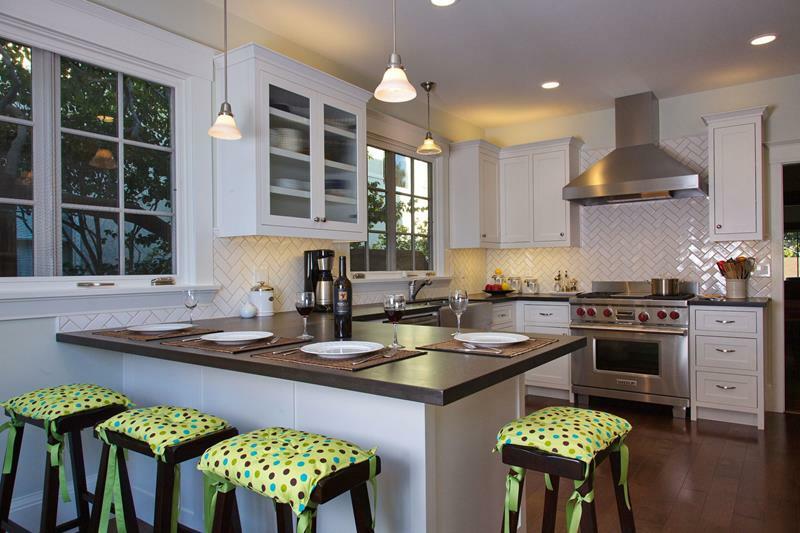 This kitchen has a modern sense of style and doesn’t overwhelm. The peninsula is simple, giving you extra counter space while looking fantastic. 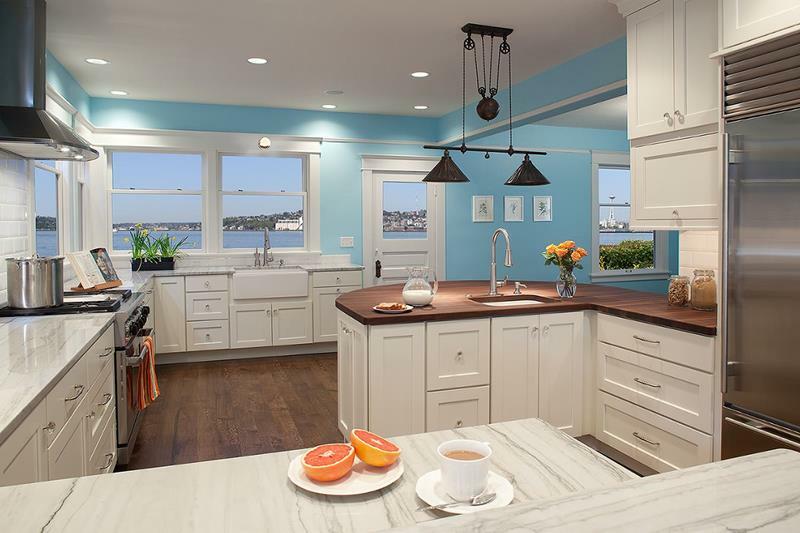 We’ll take this kitchen and it’s wonderfully large peninsula. You have a wide space for cooking and dining. 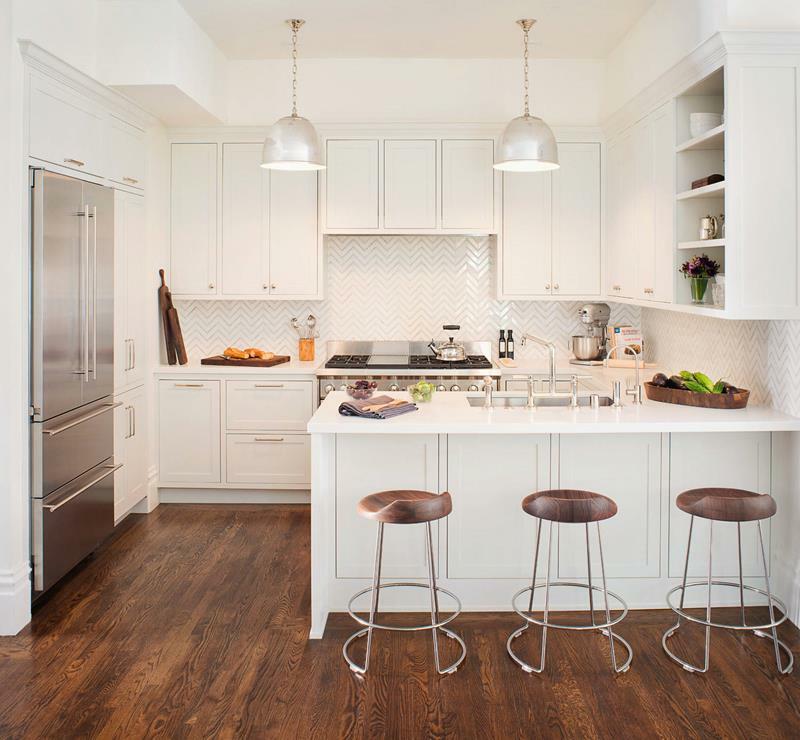 We love the overall look of this kitchen. 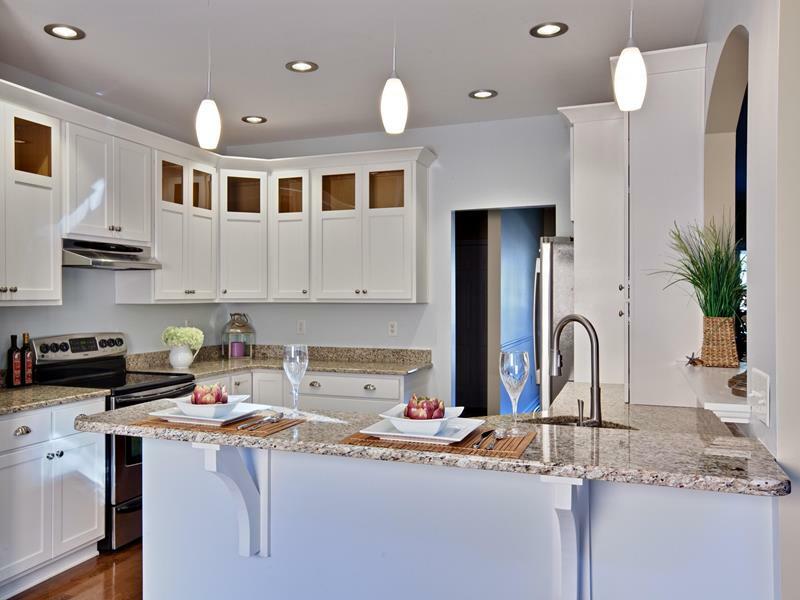 The countertops and backsplash create great contrasts with the white cabinets and you have plenty of counter space. 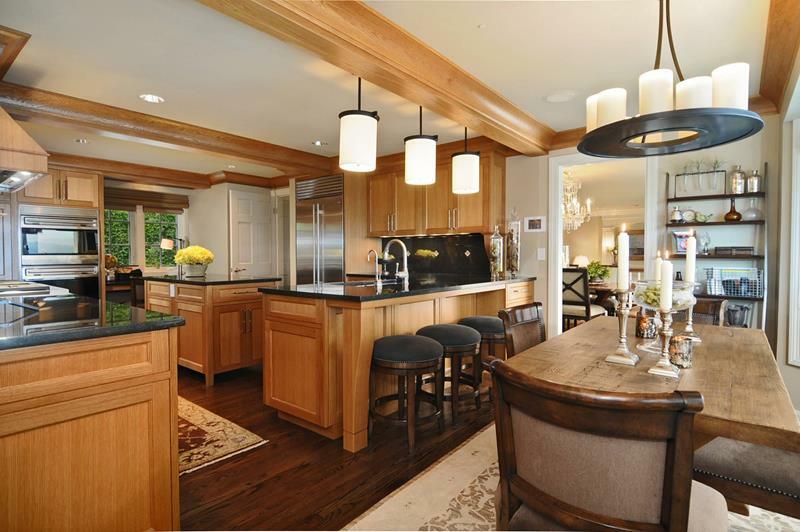 This peninsulas is the perfect boundary between the kitchen and dining spaces, not to mention it looks wonderful. We love the tropical style of this space. We love the two levels of this peninsula. The lower portion has the range and cooking space and the upper level gives you plenty of cooking space. This kitchen is wonderful. It is enclosed, creating its own little cooking dream space. 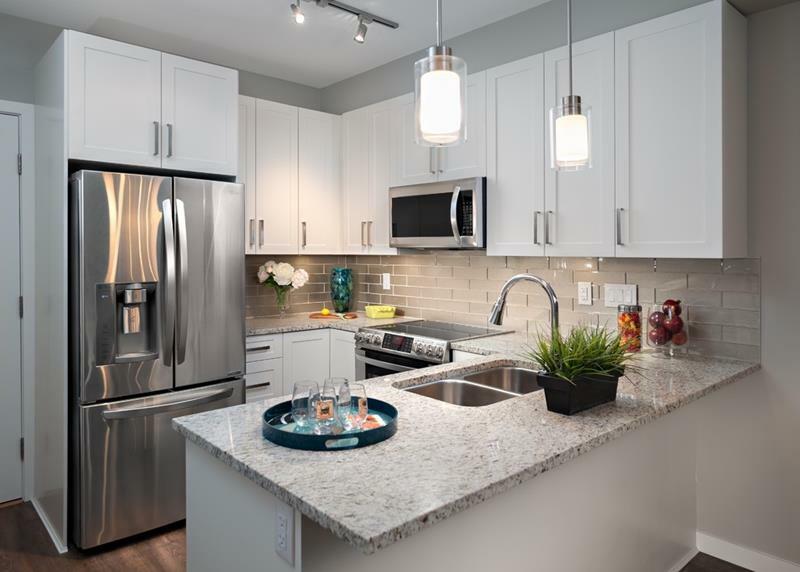 With the two levels to the counters, you have room for dining as well. 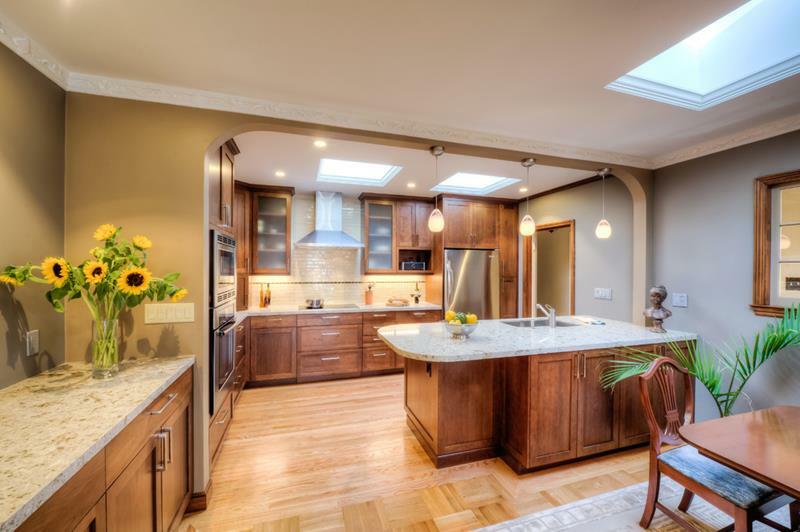 Everything in this kitchen is perfectly spaced out thanks to the abundance of counter space. 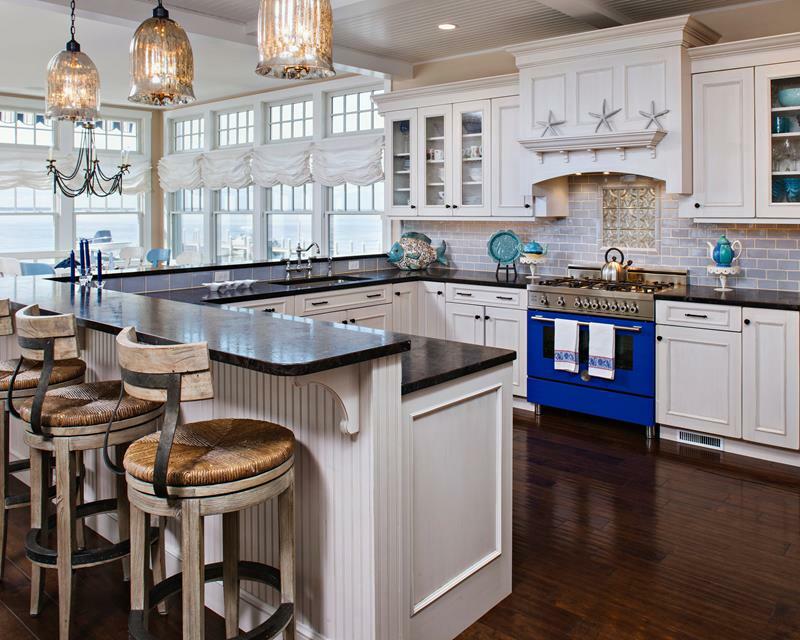 With this center island and peninsula, you can accomplish all your cooking goals. 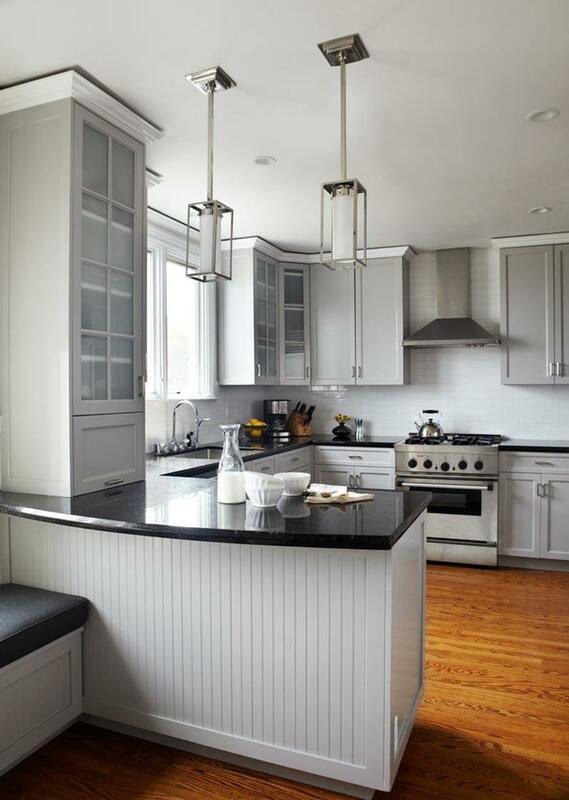 The cabinets in this kitchen contrast each other so well and we love the weathered style of the black ones. The peninsula is unobtrusive, perfectly blending with the whole space. 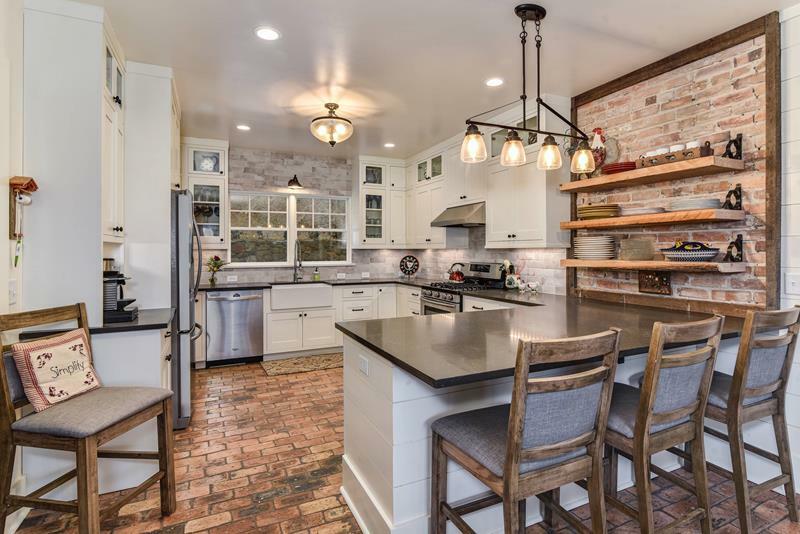 This cozy kitchen has everything you need to create and enjoy great meals. The peninsula marks the kitchen border and gives you the added space you need. Sometimes you don’t need a bunch of extra space and just a little peninsula like this one will do. 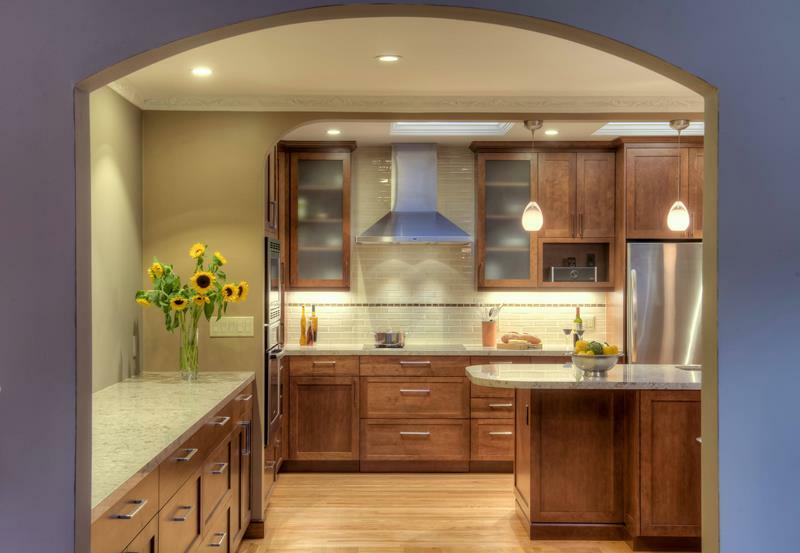 This kitchen space is pure and luxurious, with beautiful hardwood designs. The peninsula here has two levels, one for cooking and the other for eating. Thanks to this peninsula, the sink is in a great spot so that you can have plenty of counter space without feeling crowded. Photo by Ripple Design Studio, Inc. When you have a center island and a great peninsula like this one, you know you’ll never run out of space in your kitchen. Imagine this kitchen without this added peninsula. We know, we couldn’t do it either. It works so well here, giving you dining and cooking space. It’s not that you always need extra counter space, but it comes in handy when you do need it. You can pull up a stool here and enjoy a drink or meal. 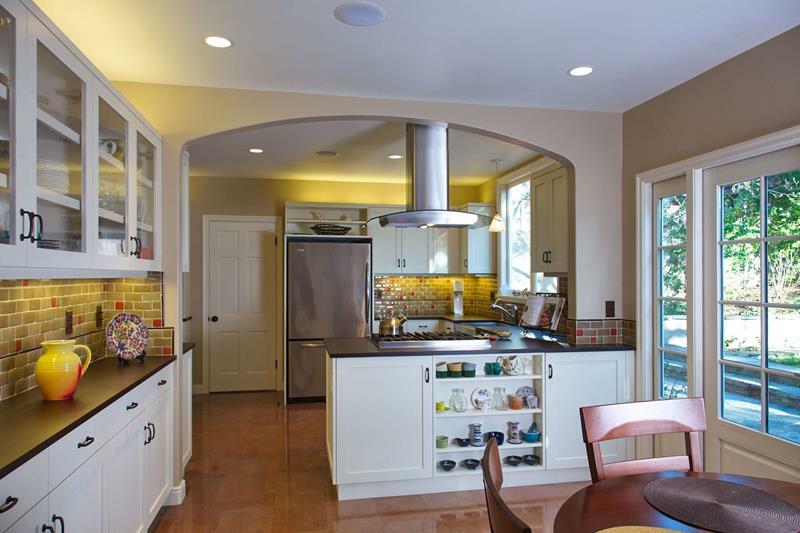 We love how the range in this kitchen is part of the peninsula. It is a great look. We also love the shelf space in the peninsula. 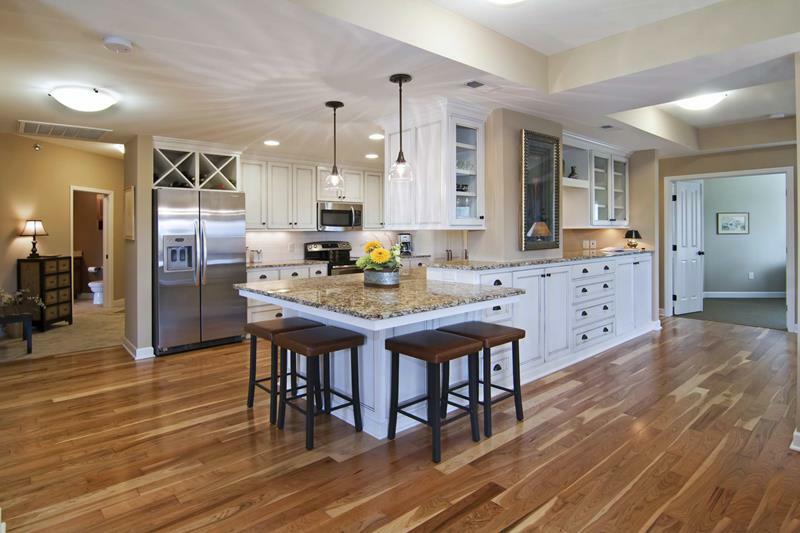 This whole space has a handsome style, with the darker countertops working perfectly with the hardwood cabinets. 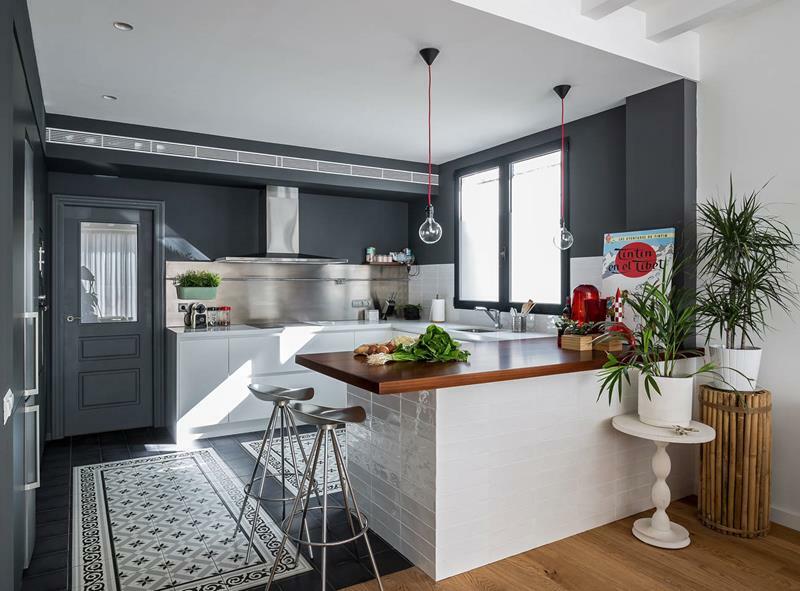 By having the peninsula contrast with the rest of the kitchen, a wonderful boundary is created. We love the look here – a contemporary yet classic blend. 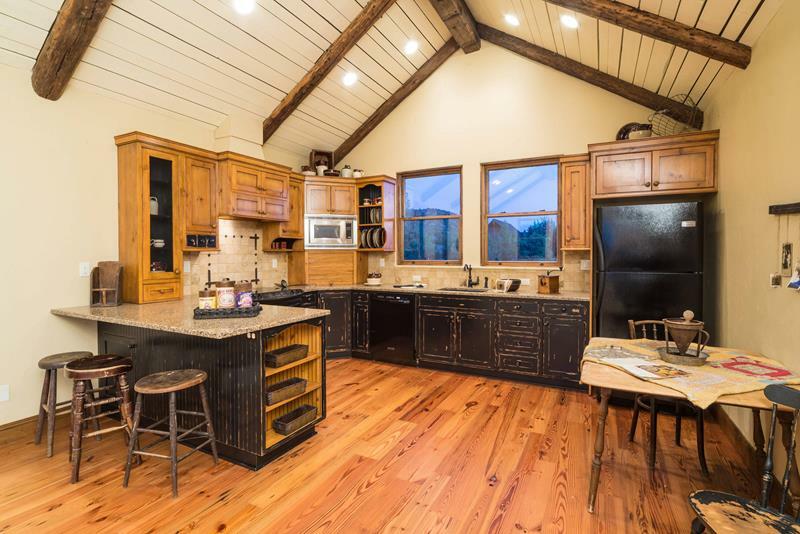 This whole kitchen gives a calm farm vibe, but makes it modern. 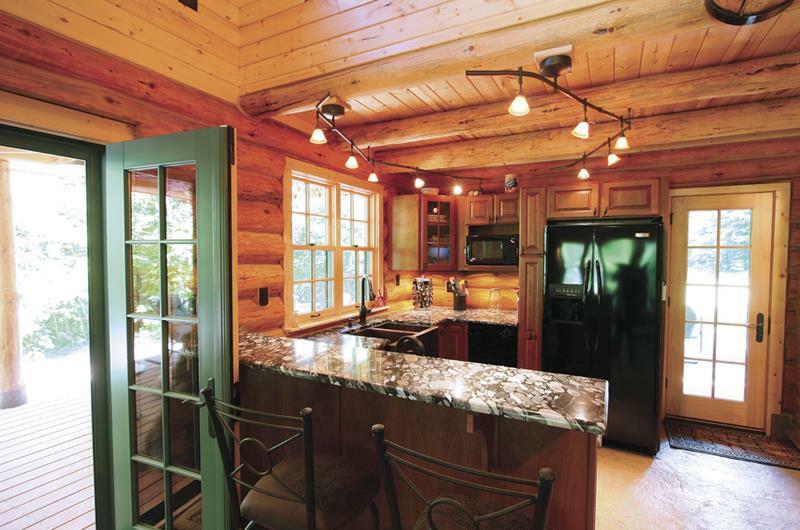 Pull up a chair to the peninsula and eat the wonderful meals you will make in this kitchen. Photo by Turan Designs, Inc. 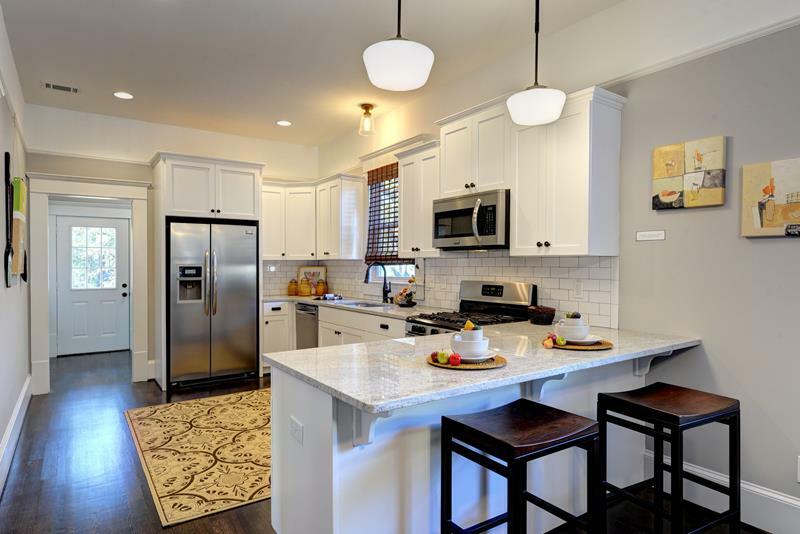 The traditional style of this kitchen has a modern feel and we love how much counter space there is. This peninsula makes the whole kitchen great. 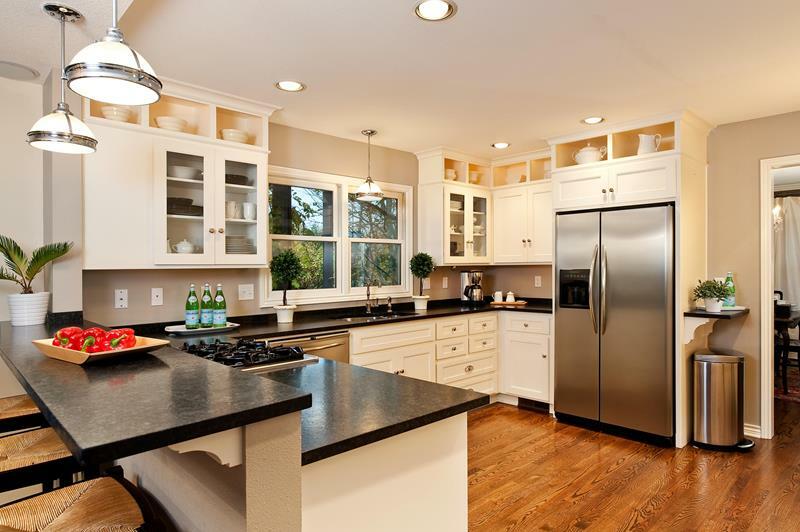 It’s a simple peninsula, rounded and stylish, giving you all the space you need in this kitchen.